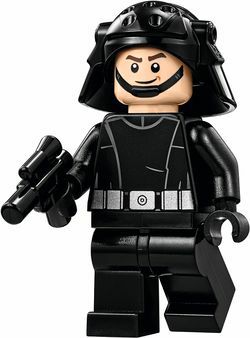 An Imperial Navy Trooper (also referred to as an Imperial Trooper and Death Star Trooper) is a Star Wars minifigures introduced in 2008. It has appeared in six sets and three video games. The Imperial Navy Trooper has appeared in three physical sets. Both have unprinted black legs, and a black torso printed with a silver belt and a black tunic with silver lining. Both have light nougat faces, one of which has a black chinstrap, and the other a dark grey one. The older figure has dark orange eyebrows, and the newer one has thinner black ones. Both have semi-bucket like helmets, with the new figure featuring a larger and more detailed helmet. Imperial Navy Troopers have also appeared in three videogames, with a very different look. They have dark grey legs, and a dark grey torso printed with a grey tunic with black lining, and an insignia placed on the left side. His face is printed with a black chinstrap, and a neutral, staring expression. He wears a black helmet that looks rather like a cross between the new and old physical version's helmets. In the game, the Imperial Trooper is armed with a gun, and has the ability to shoot, jump, and grapple. Imperial Navy troopers acted as security guards aboard Imperial Navy starships and space stations, as well as ground installations. Troopers provided the Navy with its own soldiers, making them not having to rely on the Imperial Army or Stormtrooper Corps for security. After Stormtroopers and Army troopers cleared a conflicted area, Navy troops were often called in to preform mop-up operations. However, they preformed other tasks as well, such as monitoring sensor arrays, directing hangar traffic, and escorting prisoners to their cells. Grand Moff Tarkin selected the best and most elite troopers to become Death Star troopers, who served aboard the first (and later second, though Tarkin was not alive by then) Death Star. Members of the Rebel Alliance special forces took them as a joke, thinking they were inexperienced and poorly trained. On the contrary, they tended to be well trained for their role. In the Star Wars video games, Death Star troopers have Imperial Officer bodies and simplified heads. An Imperial Navy Trooper helmet is found in 10236 Ewok Village. Facts about "Imperial Navy Trooper"
This page was last edited on 4 September 2016, at 21:03.